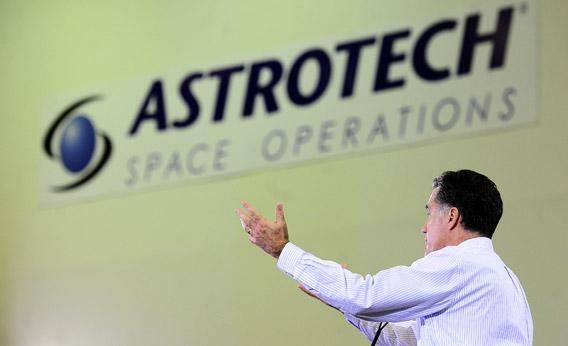 Space policy: What Obama and Romney say about NASA, ISS, and more. This article arises from Future Tense, a project of Slate, the New America Foundation, and Arizona State University that explores emerging technologies and their implications for policy and society. On Oct. 9, Future Tense will host an event on the presidential election and science and technology policy. For more information and to RSVP, visit New America’s website. Read Part 1 of Lawrence Krauss’ look at Obama’s and Romney’s views on science and technology. The 2012 Republican and Democratic platforms include two topics—energy and space—that I think demonstrate the parties’ fundamental differences in approach to science and technology issues. The parties actually agree on the basics, with both conceding that: 1) demands for energy will ultimately drive the world’s economies—as well as geopolitical tensions in the upcoming decades, and 2) in the post-shuttle era, there is a great need to develop some kind of coherent policy regarding space exploration. These facts, however, lead the parties to very different policy approaches. Let’s begin with energy. Remarkably, both parties begin their discussions with the same language, claiming that they want an “all of the above” energy policy. This phrase has become associated with the rational proposal that to achieve energy independence, we need to explore, harness, and potentially utilize all available sources of energy. But the platforms’ resemblance between ends there—and neither party offers up any surprises. The Republican platform focuses almost completely on domestic fossil fuel energy reserves and the need to exploit them by increasing domestic energy production. The crass “drill, baby, drill” refrain of Sarah Palin may be gone, but the underlying message isn’t. Concern about greenhouse gas emission is completely missing. Ultimately the point of the Republican platform is that the marketplace, unskewed by government, should determine which energy technologies we follow. Two other arguments inform THE Republican approach: 1) Energy policy is a national security issue and 2) environmental issues should be tempered by concerns about the economy. The Democratic policy, while also claiming to embrace “all of the above,” is almost to the complete opposite. Domestic production takes a back seat to focusing on investments into alternative and renewable energy sources. By my count, the phrase “clean energy” appears no less than 24 times in their platform. Indeed, it is difficult to find the word energy without the word clean in front of it. The Democrats believe energy independence will come from investment in new technologies and from reduction of demand (with clear government investment to help motivate the private sector), with modest and environmentally controlled development of our natural fossil fuel resources. Space policy is perhaps a more interesting area of convergence and divergence. Happily, things have moved forward since New Gingrich made his wild proposals to travel to the moon and Mars immediately. But as I mentioned yesterday, the Democratic platform did not see fit to mention space policy a single time, while the Republican platform clearly lays out the position that space exploration is necessary on three grounds: technological innovation, national security, and national pride. Paul Ryan has taken this argument even further, saying in a Florida speech that Obama has “broken promises” on the space program. Both candidates have to deal with space policy in their answers to the ScienceDebate question about what our space exploration goals should be. Romney essentially echoes his party’s platform, while Obama trumpets the successes under his administration, including of course the Mars Rover, a project begun well before he took office. He also takes advantage of a standard presidential prerogative: establishing space goals, including sending humans to Mars by the 2030s, that are so far in the future as to be irrelevant for all practical purposes at the present time. But as is often the case, both the Republican and Democratic space policies are most notable for what they do not talk about, rather than what they do. Why the space station? Obama emphasizes his administration’s extension of the life of the International Space Station, and Ryan criticizes the fact that we no longer send people to the station in our own rockets (though that may change if the Obama administration’s plan to have private rockets carry astronauts pans out, as I think it will). But no one talks about why we keep the stupid thing up there. More than $100 billion has been invested to produce a smelly tin can that periodically threatens to break down, and in which almost no significant scientific discoveries have been made. Why are we still wedded to this project, other than the claim that it fosters international science cooperation? For that misty goal, the space station pales in comparison to the Large Hadron Collider, which cost one-tenth as much, involves far more countries, and actually does real science. Private investment vs. public investment: The Obama administration has clearly voted to move near-Earth human space travel to private sector businesses like SpaceX—something that seems not too unreasonable, although I am still dubious about how profitable it will be for companies that do anything beyond ferrying astronauts to the big boondoggle station in the sky. But Republicans, normally so fond of private enterprise, are criticizing the loss of U.S. leadership here. While they argue we need to preserve our priority here, they otherwise want to encourage private sector investment rather than public investment in such things. You can’t have it both ways, of course, but neither party has really articulated where the appropriate breakdown should be here. Human vs. robotic space exploration: Science in space is done with unmanned probes, and humans go into space for adventure and inspiration. There is nothing wrong with the latter, but we need to be clear and open about this. No one in government is clarifying this, and the NASA budget keeps confusing the issue by lumping human space exploration into science. What about the James Webb Space Telescope? What about the Terrestrial Planet Finder? Why space? : The Republicans do list explicitly why they are interested in promoting space exploration as an engine for commerce and security. The Democrats are less explicit than the Republicans, but at least Obama annunciates one clear direct science goal: earth monitoring, though he doesn’t say what for. But neither party really addresses the central issue. What are the direct scientific and technological benefits of space exploration? I have always felt one cannot justify costly and time-consuming big science projects by focusing on spinoffs. If they are worth doing, the direct reasons for doing them should be discussed. Several knowledgeable individuals have argued that from a realistic national perspective, science has nothing to do with the nation’s space priorities. So maybe I am naïve here. If the only tool you have is a hammer, everything looks like a nail, and as a scientist, if the nation is going to spend a lot of money on something you call science, we should know what the science is. If we are doing it for pride and adventure, let’s say so up front.